Temperature has dropped down from over 40 degrees to around 20 degrees in my town and I feel the autumn is coming. I still have quite a few untried holographic polishes, so I will try as many of them as I could before it gets too cold and less sunshine. 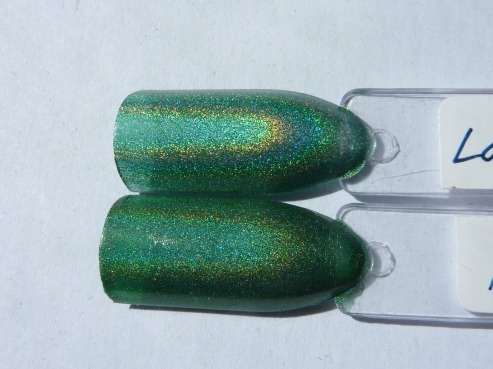 As I bought Nfu Oh Aqua Base, I don't hesitate to try Layla and Perfect holographics any more. 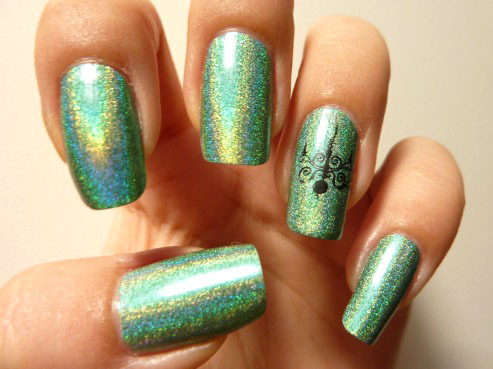 Here I'm showing you Layla Hologram Effect, Emerald Divine stamped with Messy Mansion MM06 just on my accent nail. Aqua Base sure does make this Layla holo easy to apply! I love the intense in-your-face type of holo on this polish.